Front button and external potential free (zero volt / no voltage) contacts for resetting in manual mode. Monitors and trips the circuit after the set trip delay time when ever power unhealthiness (phase failure, phase sequence, phase unbalance under voltage or over voltage) occurs. Displays all the 3 phase voltages (Line to Line) in a scrolling fashion during healthy condition. Panel / Flush mounting, PVMD-G Din rail mounting. 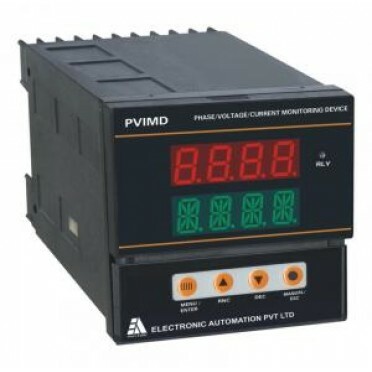 Displays all the 3 phase voltages (Line to Line) and 3 phase currents in a scrolling fashion during healthy condition. CT primary can be programmed up to 500 in steps of 5. CT secondary will be factory set for 5, 4 wire, Self powered. Range Select : Auto Ranging..